Media Briefing From L-R: Peyton Robertson, Director of the NOAA Chesapeake Bay Office, joins with VIMS Dean and Director John Wells and VIMS Director of Research and Advisory Service Roger Mann during the announcement of more than $1 million in funding for fisheries research in Virginia. Photo by David Malmquist. Blue Catfish Growth Rates VIMS professor Rob Latour (L) describes his study of blue catfish growth rates to Peyton Robertson, Director of the NOAA Chesapeake Bay Office (R). Looking on is VCU researcher Greg Garmin. 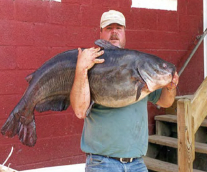 NCBO recently announced more than $1 million in funding for fisheries research in Virginia. Photo by David Malmquist. Soft-Shell Clams Dr. Rochelle Seitz, a research associate professor at VIMS, describes her study of soft clams in Chesapeake Bay to Andrew Larkin, Virginia Outreach Coordinator for the NOAA Chesapeake Bay Office and Peyton Roberston, NCBO Director, while VIMS professor Carl Hershner looks on. Photo by David Malmquist. Eleven research teams from the Virginia Institute of Marine Science (VIMS) have received funding from NOAA’s Chesapeake Bay Office to study species that play an important role in the Bay’s ecology, commercial fisheries, and recreational angling. The VIMS teams will join with partners in academia, industry, and government in both Virginia and Maryland to conduct field and laboratory studies of oysters, blue catfish, cownose rays, soft-shell clams, and striped bass. NOAA says the goal of these fisheries grants is to advance scientific understanding of key species to benefit Bay restoration efforts, the Virginia seafood industry, and recreational fishermen. The funding was announced during a media briefing at VIMS on November 29th. In addition to the projects funded at VIMS, NCBO officials also announced grants to research teams at Old Dominion and Virginia Commonwealth universities. A key aspect of the funded programs is their emphasis on collaboration between stakeholders in Virginia and Maryland. That’s particularly true of the projects dealing with oysters. “We’ve all heard that the Bay’s oyster population is estimated to be at only 1 percent of its historic level,” says Robertson, “but we actually don’t know what that distribution looks like.” A project led by VIMS professor Roger Mann will be the first-ever attempt to assess oyster stocks throughout Chesapeake Bay using standardized survey methods, akin to the collaborative process now used to assess the bay-wide blue crab population. Carnegie will also lead a study of the relationship between the height of restored oyster reefs and oyster health, while Mark Luckenbach, Lisa Kellogg, and P.G. Ross of the VIMS Eastern Shore Lab in Wachapreague will study how oyster density affects the removal of nitrogen pollution from Bay waters. The final oyster project—led by Mann in collaboration with stakeholders from the Virginia Marine Resources Commission, Cowart Seafood, Bevans Oyster Company, and the Chesapeake Bay Foundation—will determine how best to keep cownose rays from damaging restored oyster reefs. Two of the grants will fund studies of the basic biology and ecology of this poorly studied species. VIMS professor Mary Fabrizio and colleagues will provide the first estimate of population size and survival rates for blue catfish in Chesapeake Bay tributaries, while VIMS professor Rob Latour will quantify the species’ growth rate. VIMS professor Rob Hale will determine the levels of mercury, PCBs, and pesticides in blue catfish tissues, and investigate how expansion of the blue catfish fishery as a population control strategy might contribute to human consumption of these contaminants. In addition to blue catfish and oysters, the NCBO also announced funding for studies of soft-shell clams and striped bass. VIMS professor Rochelle Seitz will partner with colleagues at the Smithsonian Environmental Research Center and the Maryland Department of Natural Resources to investigate what caused the decline of the soft-shelled clam Mya arenaria in Chesapeake Bay, and what steps managers might take to restore this shellfish to Bay waters. Mya supports a significant fishery in Maryland and other Atlantic states, and is an important food source for blue crabs and fish. Fabrizio will join with VIMS professor Wolfgang Vogelbein, post-doctoral researcher Dominique Lapointe, and colleagues at ODU and NOAA to test the hypothesis that low-oxygen “dead zones” in Chesapeake Bay may be contributing to high rates of mycobacteriosis among Bay stripers, by forcing the fish out of the cool bottom waters they prefer to inhabit during the summer into surface waters whose warmth stresses the fish. 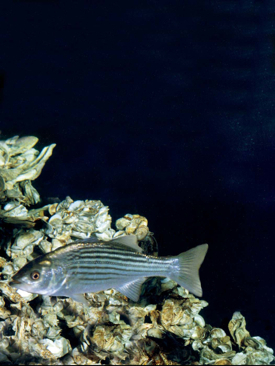 Striped bass are the most popular gamefish in Bay waters.